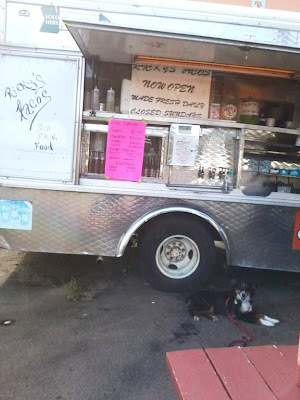 Where does Roxy('s mom) like to eat? Ummmm, Yummy! Where is Roxy now! This wonderful little place just down and around the corner from us is called Ricky's Tacos! Really folks, it's the best taco place I have eaten at in Newberg! You have got to try it! 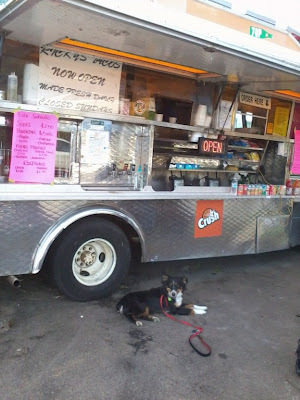 It's right next to the doggy wash on Elliot! Have you ever wondered what your dog is thinking or if they "talk" to each other? Some of you may be saying, "of course they talk to each other" while others of you aren't quite as sure. Let me assure you your pets do "talk" to each other and even to you and your other pets, it's just that it's not a language they teach in high school. For those in the Chehalem Valley area I am holding a seminar on Monday, May 6th at 7pm to teach you how to "speak" dog. I will be showing you how to use your own body to also communicate with the dogs around you to help them feel more at ease or to help them calm down if they are stressed, and how to tell when they are stressed. So put it on your calender! I look forward to seeing you there! Ok so you may or may not have a dog like Roxy who loves to work and has a natural skill at herding. Well there is a new game in town called Trieball, it uses the same skills that the dog would use against sheep, but they use big yoga balls instead of livestock. So thus began my wanting to teach Roxy how to push a ball with her nose, and the need for her to learn the commands "come by" and "away." So here I am teaching Roxy both! (and you get to see some "raw training"). I use treats to lure her around first, and then I give her a big "yay" with her ball. Then I start using the ball after I click her so it got her more excited, which is good and bad. I had to work at keeping her more focused when I brought the ball out. I am hoping to get some other dogs involved here and have some competitions later on maybe near the end of summer. Let me know if you are interested in teaching your dog how to play! 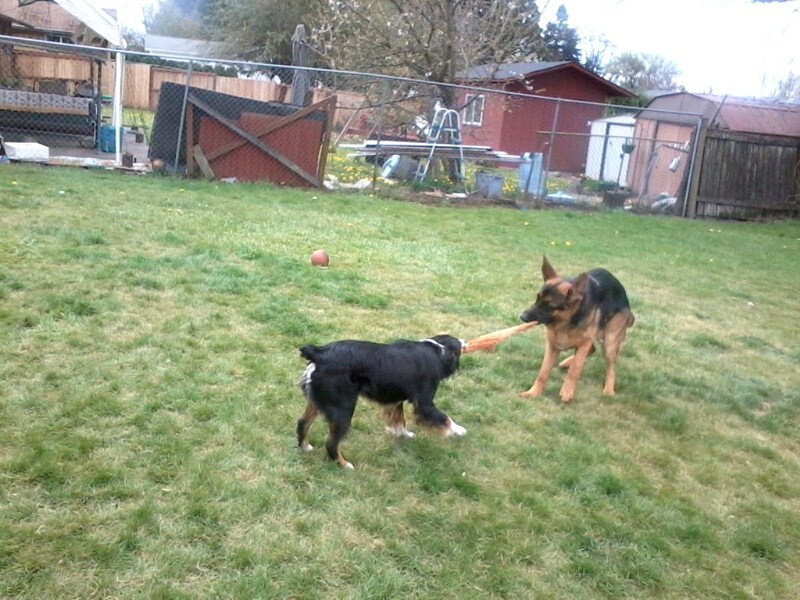 I have had many people ask me if it's ok to play tug with their dogs, or will that make them feel aggressive or cause them to become more aggressive? To answer that simply, no. 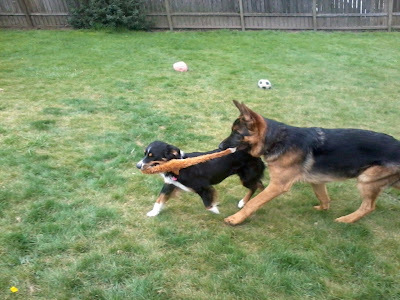 Dogs love to play tug with each other as well as with their human friends, in my experience I have found it to actually decrease a dog's aggressiveness in most cases. 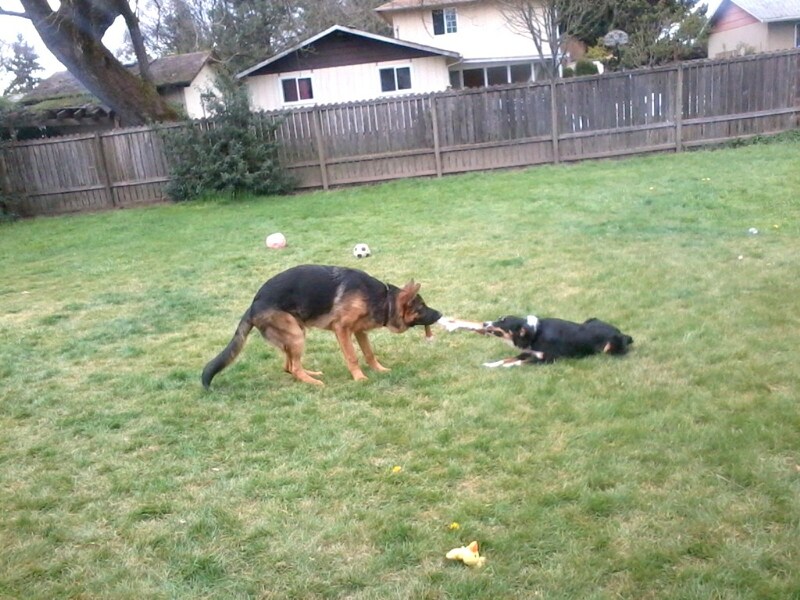 Take Conner here, he's a big puppy, but he is still intact and very interested in Roxy. However when we get them playing tug, it seems that most of his hormone issues regarding her seem to diminish and he is more interested in playing than in other activities. The same has held true with many other dogs who have had the same issues when we are in class. 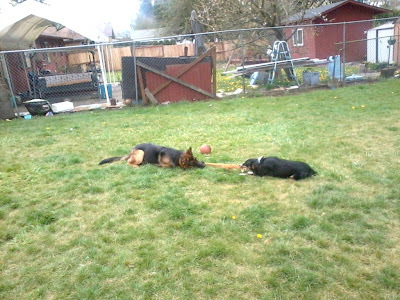 Dogs know that tug is a game, in fact that is why I try and make sure everyone who has a class with me knows that you never chase your dog or try to pull things out of their mouths, because they think it's a game.